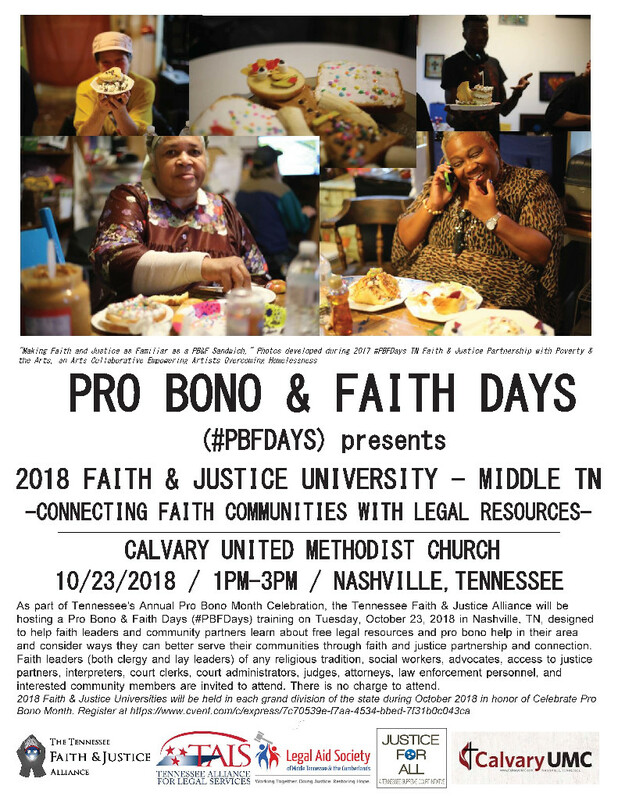 The Tennessee Faith & Justice Alliance (TFJA) is hosting its second annual statewide Pro Bono & Faith Days (#PBFDays) this month as part of Celebrate Pro Bono Month. 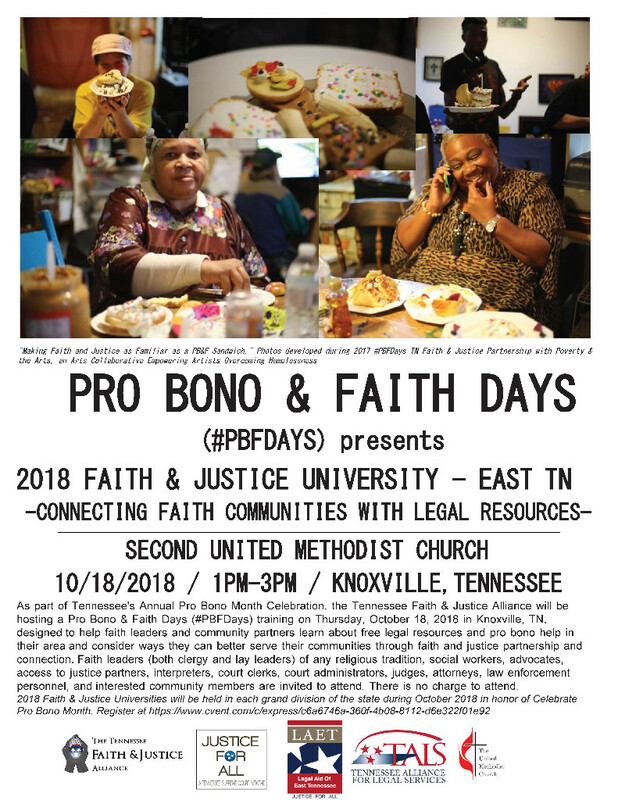 Faith & Justice Universities will be held in each grand division so that attendees can learn about existing free legal resources in their communities and how to get more involved: Events will be in Memphis on Oct. 16, Knoxville on Oct. 18 and Nashville on Oct. 23. The TFJA is part of the Supreme Court’s Access to Justice Commission. 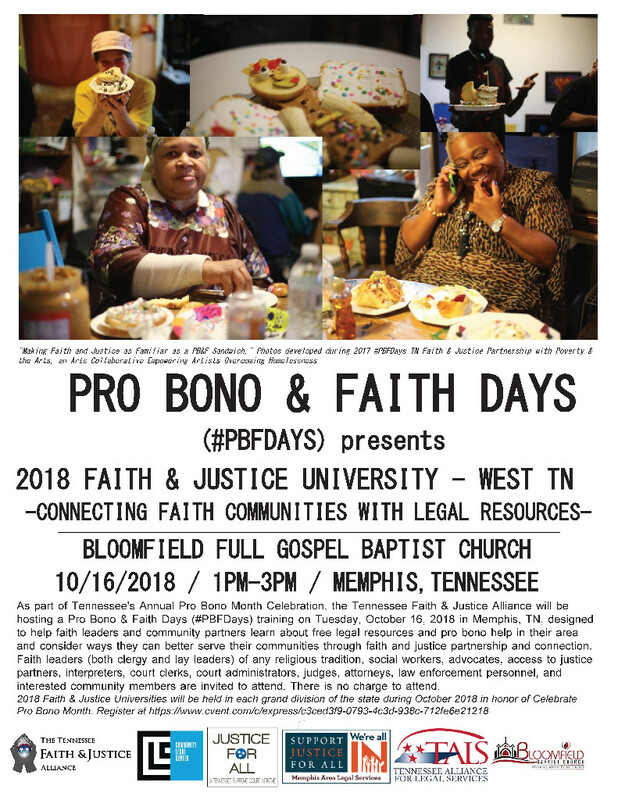 It is an alliance of faith-based groups in Tennessee who commit to providing legal resources to their congregations and communities. The Legal Aid Society of Middle Tennessee and the Cumberlands has scheduled a Free Legal Help Clinic for seniors on Oct. 16 from 9 a.m. to 1 p.m. at Life Church, 2223 N Washington Ave., Cookeville, TN, 38501. The event will be coordinated through the Tennessee Senior Law Alliance, and in partnership with the Tennessee Commission on Aging and Disability. All lawyers are invited to help at this advice-only clinic. To volunteer or for more information please contact Matt Silvey, 931-528-7436. All across Tennessee events are taking place this weekend as part of the Celebrate Pro Bono month. On Saturday, the Memphis Law Student Bar Association and Memphis Bar Association are joining together to host the Race Judicata (The Run for Justice!) in downtown Memphis. This event, which also features an afterparty with food, drink and live music, benefits the Memphis Bar Association’s Access to Justice program. To the east, Knoxville lawyers will be providing free legal advice at the Knox County Super Saturday Bar Advice Clinic, hosted by Legal Aid of East Tennessee. That event runs from 9 a.m. to noon. Find out more about other Celebrate Pro Bono events taking place across Tennessee. Legal Aid Society of Middle Tennessee and the Cumberlands’ Nashville office has hired Emma Sholl as its new managing attorney. Sholl has been a staff attorney at the Legal Aid Society since 2014, focusing on health, benefits and special education issues. Her accomplishments at the firm include securing coverage of life-saving medications and services for Medicaid clients, advocating for special education services for children with disabilities and obtaining home health care and nursing services for elderly clients. She co-chairs Legal Aid’s Gilbert Family Fellowship program. Bass, Berry & Sims in conjunction with the Community Legal Center and the Vanderbilt Immigration Practice Clinic is hosting a CLE called "How To Help Immigrants In Tennessee: Beyond Rapid Response" on Oct. 9. Participants will be trained on the basics of litigating removal defense cancellation of removal cases, with the goal of placing cancellation cases with attendees to provide pro bono assistance. The training will take place at Bass, Berry & Sims' Nashville office from 8 a.m. to 1 p.m. Space is limited, so registration priority will be given to individuals who sign up to a pro bono case. What does a South Dakota case have to do with us here in Tennessee? After Wayfair, our cover story points out, there will be significant impact on commerce and tax collection in our state, too. Also, it is the 10th anniversary of Celebrate Pro Bono Month! Read about its impact and how you can get involved; a word from TBA President Jason Pannu on the legal needs of low-income Tennesseans; and the remembrance of pro bono lawyer and historical hero, Lutie Lytle. Read the whole October issue here. The TBA Young Lawyers Division is seeking volunteers for an expungement clinic on Oct. 27 at Nashville's Cathedral of Praise, 4300 Clarksville Highway. The event will be hosted by the National Prison Summit. Registration for pre-registered participants will take place from 8 - 9 a.m. and the clinic will start at 9:30 a.m. All volunteer attorneys are asked to arrive at 9 a.m. for orientation and the run of the day. The Criminal Court Clerk’s office will have computers and the ability to process the expungement paperwork right on the spot. The clinic is expected to end around noon. Those who wish to volunteer should contact Amber Floyd. Legal Aid Society has scheduled a Free Legal Help Clinic on Oct. 6 from 9 a.m. to noon at Corinthian Missionary Baptist Church, 819 33rd Ave. North in Nashville. The clinic will be held in partnership with OneNashville and students from Belmont College of Law. All lawyers are invited to help at this advice-only clinic. To volunteer or for more information please contact Jorge Salles Diaz, (615)780-7131. The Tennessee Supreme Court Access to Justice Commission is sponsoring a series of Regional Family Law Summits. The summits will bring together judges, court clerks, lawyers, mediators, law students, educators, and anyone interested in innovative ways to help Tennesseans with family law issues. West Tennessee's will be held Sept. 24 at the Benjamin L. Hooks Public Library in Memphis from 2 - 5:30 p.m. Middle Tennessee's will be held Sept. 25 at Nashville School of Law from 1:30 - 5 p.m. East Tennessee's will be held at the United Way in Knoxville from 1:30 - 5 p.m. The Tennessee Immigrant and Refugee Rights Coalition, Hillcrest United Methodist Church and the Nashville Mayor’s Office of New Americans are seeking attorney volunteers for their “Become a Citizen Now!” workshop, held on Sept. 22 in honor of National Citizenship Day. Local families who are legal permanent residents will receive assistance in applying for naturalization at the event, which will take place from 9 a.m. – 4 p.m. Interested attorneys should complete this form to take part. The Legal Aid Society of Middle Tennessee and the Cumberlands will host an open house for its new office on Thursday. The Sweet Soiree Open House will be held from 4:30 to 7 p.m. at 1321 Murfreesboro Pike, Suite 400. RSVP here. The TBA is seeking nominations for three prestigious access-to-justice-related awards. The TBA Public Service Awards recognize service in three categories: work performed by an attorney employed by an organization providing indigent legal representation; pro bono work performed by a private attorney; and pro bono commitment demonstrated by a law student volunteer. Nominations for the Public Service Awards are due Sept. 21. Awards will be presented at TBA’s Annual Public Service Awards Luncheon on Jan. 19. For more information about these awards, contact Access to Justice Director Liz Todaro. Lipscomb University's Fred D. Gray Institute for Law, Justice & Society will host a free legal clinic in Nashville at 6:30 p.m. on Sept. 11 at Schrader Lane Church of Christ, 1234 Schrader Lane, Nashville, 37208. It will be an advice-only clinic with no expectation that volunteers take on continuing representation. For more information or to volunteer, contact Randy Spivey, 615-966-2503. Outgoing Metro Nashville Public Defender Dawn Deaner is embarking on a new mission with a new project – the Choosing Justice Initiative. The Nashville Scene reports that the program will see Deaner taking on clients who can’t afford an attorney but can’t get a public defender either. In an effort to give poor defendants more say in the process, Deaner says she’ll seek to be appointed to cases after clients choose her to represent them. Deaner served in the Public Defender's Office for more than 20 years. Martesha Johnson was sworn-in as her replacement last week. Bryan Stevenson, the founder and executive director of the Equal Justice Initiative in Montgomery, Alabama, spoke in Murfreesboro on Saturday as a part of the 17th Middle Tennessee State University Convocation, The Daily New Journal reports. Stevenson addressed the incoming and returning students with a message calling to promote social justice. He also authored “Just Mercy: A Story of Justice and Redemption,” which served as the Class of 2022’s summer reading assignment. The Community Legal Center in Memphis will host the second annual “Jam for Justice” concert fundraiser on Sept. 29. The event will kick off at 6 p.m. at Railgarten, 2166 Central Ave. It’s free to attend but donations of any amount are accepted. The Legal Aid Society of Middle Tennessee and the Cumberlands has named Charles K. Grant as its new board president, The Tennessee Tribune reports. Grant succeeds Bob Martineau Jr., who served as president since 2016. Grant, a Nashville litigator with Baker Donelson, was first vice president of the Legal Aid board. His term as president lasts through 2020. Legal Aid of East Tennessee (LAET) will host its annual Tri-Cities Celebration of Pro Bono Service on Aug. 23 at the Tipton Haynes Historical Site, 2620 South Roan Street, Johnson City. The Heritage of Justice Jubilee begins with a reception at 5:30 p.m. with the awards presentation to follow. The celebration includes live music, barbecue, a silent auction and a cash bar. Reservations are $35 per person. For more information, or to make reservations, call (423) 794 2487 or visit www.laet.org. Howell Peoples, who served as Hamilton County chancellor for 32 years, died Friday, The Times Free Press reports. He was 75. Legal Aid of East Tennessee released this statement on Peoples' passing: "Chancellor Peoples was inducted into the Legal Aid of East Tennessee Pro Bono Hall of Fame in 2016 for his dedication to pro bono work and for being the first legal aid lawyer funded by LSC in Chattanooga, paving the way for quality legal services for our low income and vulnerable neighbors. He was a pillar in the legal community and will be missed." The TBA will post updates as arrangement details are made available. The TBA Young Lawyers Division is seeking volunteers for an expungement clinic Aug. 18 in Nashville. The clinic will be held at New Covenant Christian Church, 2201 Osage Street. Sign-in for the pre-registered participants begins at 9 a.m. and the clinic will start at 10:15 a.m., running until noon. All volunteer attorneys are asked to arrive at 9:30 a.m. for orientation and the run of the day. The Criminal Court Clerk’s office will have computers and the ability to process the expungement paperwork right on the spot. Those available to help should contact Amber Floyd. The University of Tennessee College of Law Pro Bono and Legal Clinic are working together to assist Tennessee drivers whose licenses have been suspended, following a federal court decision that deemed unconstitutional Tennessee’s practice of revoking driver’s licenses for failure to pay court costs. The License Reinstatement Project includes a hotline and a website which people utilize for information or help with the process of getting their license reinstated. The Tennessee Alliance for Legal Services (TALS) has announced the winners of its 2018 Access to Justice Awards. Justice Frank Drowota III will be honored posthumously with the Janice M. Holder Award for his career of service and legacy to the access to justice community, alongside Amber Floyd of Wyatt, Tarrant & Combs in Memphis for her work spearheading statewide expungement clinics. Other award winners include past TBA president and immediate past chair of Tennessee's Access to Justice Commission Marcy Eason along with former executive director of the Legal Aid Society of Middle Tennessee & the Cumberlands Gary Housepian, who are joint recipients of the B. Riney Green Award. Vanessa Bullock of West Tennessee Legal Services will be recognized as the New Advocate of the Year. The honorees will be celebrated during TALS’ Equal Justice University Conference Aug. 29 in Murfreesboro.